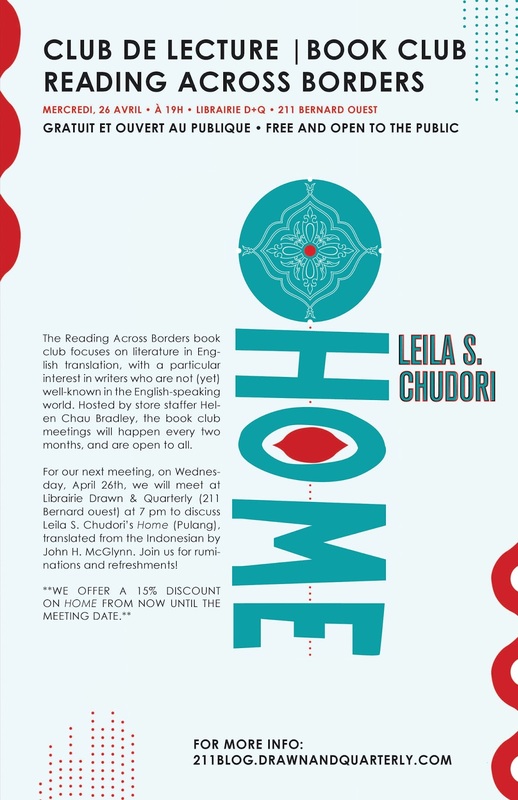 Tonight, Wednesday, April 26th, the Reading Across Borders book club will meet at Librairie Drawn & Quarterly (211 Bernard ouest) at 7 pm to discuss Leila S. Chudori's Home (Pulang), translated from the Indonesian by John H. McGlynn. Join us for ruminations and refreshments! We regret that the bookstore is not wheelchair accessible. There are two steps at the entrance, followed by two doors that open inward. Once inside, there are no additional steps to access the bathroom, although the bathroom space is narrow. Home is an ambitious saga that spans years and continents, beginning with the establishment of the Suharto dictatorship in 1960s Jakarta and threading its way through the lives of leftist Indonesian political exiles in Paris in the following decades. It complicates the meaning of "home" through its characters' varying senses of displacement and belonging. The novel is filled with heady love affairs and mouthwatering culinary passages, even as it establishes itself within the context of horrifying violence and loss. Leila S. Chudori is known as Indonesia's most prominent and outspoken female author and journalist.